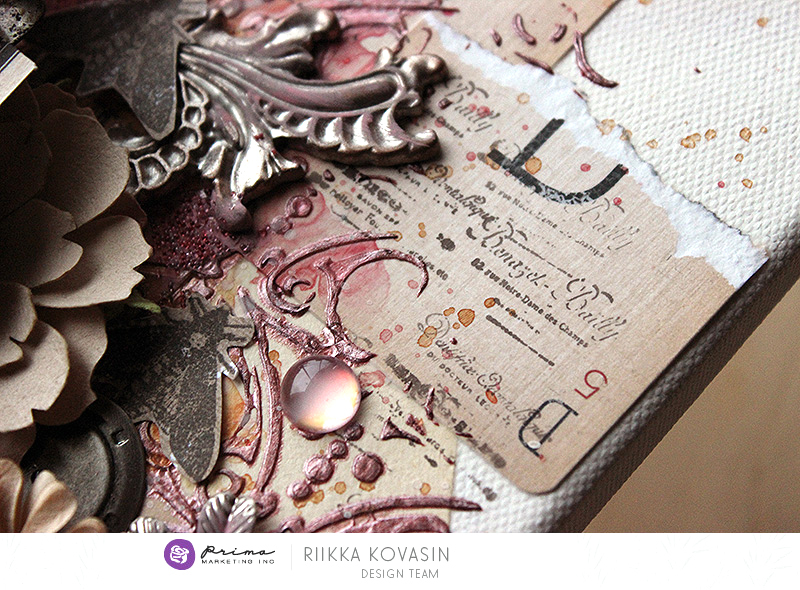 I love to use mixed-media touches in my layouts, as you might have seen, but where my true passion lays is altered pieces and assemblage-styled canvases. I usually start with flat layers, like in this piece, and then gradually go for the height. I adore black gesso, but during last year I kind of rediscovered the tones of old paper and tea again and have been using them since. This canvas is no exception – I start with old paper mixed with Vintage Alpha cards and then add tea tones to the watercolor layer. My pieces usually evolve around an object. This time that is an old palette knife. What I also like to do is to have something vertical and something horizontal in the creation. Here the palette knife acts as a strong vertical line where as the flowers and other embellishments make up the horizontal axle of the project. I taped a video while I made the piece. This time I didn’t make separate tips, but, if you read the text above carefully, you’ll find some there! I hope you enjoy the project and find it inspiring! I just love the tips Riikka shares in each video and in her write-up! So many useful ideas for getting better results and more pleasing compositions!